A federal judge on will hear arguments in the lawsuit on behalf of Joseph Casias, a 30-year-old cancer patient who lost his job after a routine drug screen found he had used medical marijuana. Casias was registered in Michigan to use it to treat pain. The Drug Enforcement Administration has issued a new guideline intended to help ease the delay some nursing home residents face in receiving certain painkillers and anti-anxiety medications. The D.E.A. had not previously recognized nurses employed by nursing homes as the legal agents of doctors in conveying controlled substances prescriptions to pharmacists. The agency’s previous stance, critics said in an article last week in The New York Times, caused many nursing home residents to suffer in pain while they waited for their prescriptions. Morphine, as a narcotic, has such a bad reputation in many poor countries that doctors cannot obtain it for their patients. A new report from Human Rights Watch describes the suffering of children in pain in Kenya. Is America's criminal justice system weighed down with bad science, ineffective methods, incompetence and corruption? Penn & Teller set out to reveal that the only thing scarier than crime is America's war on crime. "Criminal Justice" will start airing this Thursday at 10:00pm. In the meanwhile, you can read more about Richard Paey in our archive, at the Pain Relief Network or in the 2006 Sixty Minutes episode, "Prisoner of Pain." In a case that illustrates the hazards physicians face when fulfilling their duty to relieve patients' pain, a federal jury yesterday found Kansas pain management physician Dr. Stephen Schneider and his nurse wife Linda guilty of conspiring to profit from illegally prescribing pain relief medications to patients, dozens of whom died. The couple had been charged in a 34-count indictment with illegally dispensing drugs, health care fraud, and money laundering. Jurors found them guilty of a conspiracy linked -- however tenuously -- to some 68 deaths. Prosecutors portrayed the couple as money-hungry pill pushers who not only wrote prescriptions for those in severe pain but also for drug abusers who faked their symptoms. "The evidence in this case of patients suffering from overdose and death points to the fact that when prescription pain killers are unlawfully prescribed, they can be as dangerous as illegal drugs," US Attorney Lanny Welch said in a statement. Attorneys for the Schneiders and pain relief advocates had a different take. "We are absolutely shocked," Dr. Schneider's attorney Lawrence Williamson said outside the courthouse. "These two people are totally innocent of these charges." Saying it was "a sad day for our justice system today," Williamson added that an appeal was planned. "Dr. Schneider was practicing medicine -- he wasn't being a drug dealer," Williamson said. Both husband and wife were found guilty on five counts of illegally writing prescriptions and 11 counts of health care fraud. They also faced 17 money laundering counts. Stephen Schneider was found guilty of two of them and Linda Schneider was found guilty of 15 of them. The couple was taken into custody after the verdicts were read. They face mandatory minimum sentences of 20 years on the most serious counts and could be sentenced to life in prison. The judge in the case has not yet decided whether to go ahead with seizing their assets. Siobhan Reynolds, head of the patient and doctor advocacy group the Pain Relief Network, which had championed the Schneiders' cause, was also present for the verdict. "The crisis in pain treatment is going to deepen even further," Reynolds said outside the courtroom. "People are going to have trouble getting care because doctors are afraid this is going to happen to them." Schneider had testified that he was only trying to help patients in pain and that he had been deceived by some of them. He also said he had never meant to hurt or defraud anyone. Defense attorneys for the pair had argued that the government was meddling in doctor-patient relationships and that the government had overinflated the deaths attributable to Schneider's prescribing by including patients who committed suicide, patients who took illegal drugs, patients he had never seen or had treated months before their deaths, and patients who died while the couple was in jail. Federal authorities have prosecuted hundreds of pain management physicians in the last decade, throwing what advocates say is a pall over pain management and deepening what they say is a crisis in chronic pain treatment. Now, the Schneiders and the patients they will not be able to help are the latest martyrs in the battle for chronic pain treatment. My wife and I just solved a problem getting the 90 days of pain medication we need to go see the grand-kids in Oregon and Montana. It was just a mis-communication with the doctor. Now Walmart pharmacy can't seem to get enough morphine.We dropped off two prescriptions for morphine IR on June 9th. When we dropped it off they told us that they were out of morphine, and they wouldn't get any until Thursday the 17th. My pain doctor requires we sign a pain contract that says we can only fill prescriptions at one pharmacy. I don't think he would drop me for going to another pharmacy, but it's just not worth the risk. My wife went in to pick up the prescriptions on Friday the 18th, and they had only one prescription filled. Now they tell her that they won't have more morphine until next Thursday June 24th. To wait 15 days to get a 30 day supply of medicine is ridicules. Someone at Walmart dropped the ball. Morphine is not the type of medicine you can just run out of, if a patient is withdrawn too quickly, they will go through withdrawals and get really sick. This has nothing to do with being addicted, it has to do with dependence. Anyone taking an opiate for a couple weeks or so, will go through withdrawals if the drug is withdrawn too quickly. Pharmacist should be able to fill partial prescriptions of Schedule II medications, and be able to fill the remaining portion of the prescription of the prescription when the pharmacies supply is replenished. This is currently not allowed by DEA. If a Schedule II prescription is partially filled, the pharmacist is not allowed to fill the remaining portion of the prescription. This seems to place a hardship on pain patients. We need a federal pain patients bill of rights that spells out both the patients responsibilities, and the doctors responsibilities. A Kansas doctor and his wife who operated a pain management clinic in Haysville until their arrest by DEA agents in December 2007 went on trial in federal court in Wichita this week. Federal prosecutors charge that Dr. Stephen Schneider and his wife and nurse, Linda, ran a "pill mill" that illegally distributed pain-relieving drugs to addicted patients, but the Schneiders and their supporters say he is a compassionate doctor who provided high dose prescriptions to patients suffering from chronic pain because that's what they needed. The Schneiders are charged under a multi-count indictment with conspiracy to illegally distribute drugs, money laundering, and health care fraud. Prosecutors say 68 of their patients died of drug overdoses and hold them responsible for 21 of those deaths. The Schneiders' attorneys say they were not responsible for any patient deaths. 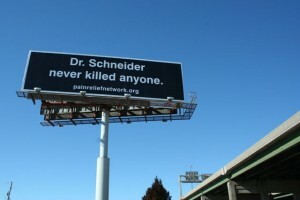 The Schneiders and their supporters, including the Pain Relief Network, a national pain advocacy group, argue that they ran afoul of an overzealous federal prosecutor, Assistant US Attorney Tanya Treadway, who is improperly prosecuting them for their prescribing decisions. This prosecution, they say, is part of a broader attack on doctors who prescribe high levels of opioid pain medications by the DEA and federal prosecutors. Treadway has also gone after the Pain Relief Network, first unsuccessfully seeking a gag order to block the group's leader, Siobhan Reynolds, from criticizing the prosecution, and then using an obstruction of justice investigation to demand that Reynolds turn over all documents related to the group's effort in the case. Reynolds initially refused, but relented after a contempt citation and accrued fines of $36,500. In opening arguments this week in what is expected to be a two-month trial, Assistant US Attorney Treadway portrayed the Schneiders as greedy criminals. "This is a case about money, not medicine," she told jurors. Treadway said prescriptions were dispensed when Schneider was not president (but did not mention that physician assistants employed by the clinic could legally prescribe the drugs). "This caused abuse, overdoses, and deaths," she claimed. Treadway even used the clinic's architectural style against the Schneiders, comparing its appearance to that of a Mexican restaurant. "And like a Mexican restaurant, people lined up at the door, waiting to get in," the prosecutor said. But Stephen Schneider's attorney, Lawrence Williamson, likened the government's case the Dan Brown novel, "The Da Vinci Code," calling it "historical fiction." Williamson argued that the Schneiders were taking in Medicaid patients no one else would and billing the government more than any other doctor in the state. "He was costing them too much money," so the government decided to shut him down, the attorney argued. While Treadway hammered on the 68 deaths among Schneider patients, Williamson pointed out that the practice had cared for more than 10,000 patients and was not aware of the extent of overdoses until federal prosecutors filed criminal charges against them. Kevin Byers, representing Linda Schneider, who managed the clinic, said the couple were not guilty of the conspiracy charges. "The only thing they conspired in was a marriage," he said. "They ran a business together. That's the only conspiracy." Stay tuned for more updates on the trial as it progresses. I have a friend who has a variety of acute medical problems including severe diabetes, hepatitis C and liver cancer. He is now in the final stage of life. The doctors prescribed over 15 different drugs to him during the last several years. He was prescribed oxycontin, and in high doses for 7 years. No longer able to afford his private medical insurance, he went to the VA (he is a Vietnam vet) where his oxycontin presription (240 mg. per day) was replaced with a prescription for 20 mg. per day of methadone. He was "accused" of enjoying the oxy. He had to sign a "narcotics contract" to get the methadone. Of course the small allotment of methadone was not nearly enough. A month later his urine sample contained no methadone metabolites and he was accused of selling the methadone, which he had used up long before the month was through. Another urine sample tested positive for oxycodone and cannabis, which he had admitted to procuring on the street as he was both addicted after 7 years of prescribed oxy, and in need of analgesic medication for pain. He is quickly deteriorating, in pain and bedridden. When he takes enough oxy he is out of bed, active, and has some degree of quality to what is left of his life. Because he "violated" the terms of his narcotics contract he is denied prescriptions for oxy or any other narcotic drug, despite the fact that these drugs are precisely what he needs to experience any enjoyment and functionality during his life's final chapter. It's Not Just Marijuana. DEA is at War With Other Medicines Too. Heightened efforts by the Drug Enforcement Administration to crack down on narcotics abuse are producing a troubling side effect by denying some hospice and elderly patients needed pain medication, according to two Senate Democrats and a coalition of pharmacists and geriatric experts. Terence McCormally, a doctor who cares for patients in nursing homes in Northern Virginia, said the tug of war reflects "the tension between the war on drugs and the war on pain." "For the doctor and the nurse, it's a nuisance," he said, "but for the patient it is needless suffering." Our efforts to control the lives of people who take drugs for fun have led us to destroy the lives of people who take drugs for serious medical conditions. The harsh reality here is that the best medicines often become popular with people they weren't intended for. That's going to happen no matter what you do. But if every effective pain reliever is overly restricted, then the medicine's primary purpose of relieving pain can never be achieved. The drug war has gone blind even to the most basic functions that drugs are supposed to serve in our society. As efforts to prevent diversion and recreational use continue their inevitable failure, we face a very real threat that desperate drug war bureaucrats will legislate many of our best medicines out of existence.